Apple Inc. has halted shipments of MagSafe power adapters for its MacBook Pro notebook line as a result of quality design issues and is presently working on a fix, AppleInsider has been told. Several people familiar with the matter say the Cupertino-based firm began pulling inventory of the 85W power supplies from its retail stores a few weeks ago. Those same people say Apple also discontinued shipments to third party retailers ahead of "redesigned" models that are expected to ship sometime later this month of early next. MacBook Pro owners have consistently reported on at least three reoccurring issues with their adapters. Therefore, it's unclear if any one particular problem is to blame for Apple's decision to halt sales of existing models, or if all of the issues eventually combined to force a change in the design. Of the potentially more serious problems are reports dating back to last year that the thinner of the two adapter cords has a tendency to heat up and fray near both the power brick and the MagSafe connector, creating a potentially serious hazard. As noted in a AppleInsider report from March, Apple has made at least one attempt to remedy this problem by increasing the strength of the plastic insulator where the cord meets the MagSafe connector. Another, more recent issue is a tendency for the tiny pins inside the MagSafe connector to improperly spring back into place, resulting in a faulty connection between the MagSafe connector and the MacBook Pro's built-in power adapter port. 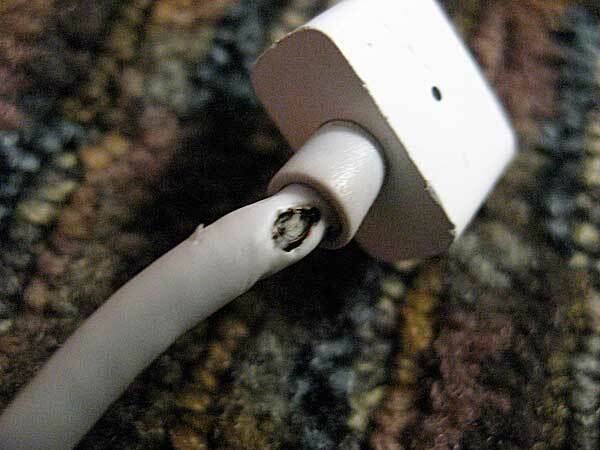 A Melted MacBook MagSafe Adapter Posted to the flickr Image Sharing Website. And lastly, some adapters —including those owned by AppleInsider —are showing signs of a somewhat benign defect where the LED indicator light on the MagSafe connecter will intermittently shut off even though the adapter continues to charge the MacBook Pro. A quick check with the Apple online store indicates that new orders for the MacBook Pro's 85W power adapter will ship in about 2 to 3 weeks. In the meantime, however, customers who've had their adapters fail just recently have been left scrambling to find a replacement from part suppliers or auction sites such as eBay. Apple has reportedly declined to ship replacement units until the redesigned adapters are available and all major retailers list the product as being on backorder.